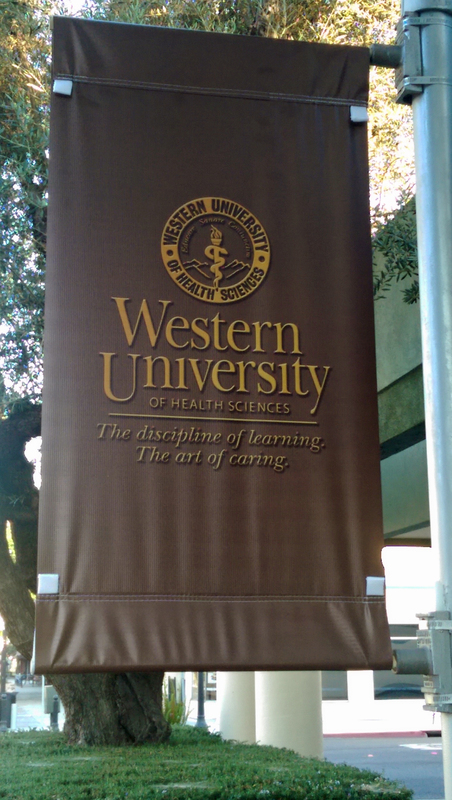 I posted this tribute to Philip Pumerantz, PhD, on April 15, 2015, shortly after he announced his retirement as President of Western University of Health Sciences. In it, I briefly examined some noteworthy leadership traits that I observed in my limited contact with him. With the announcement of his passing on December 26, 2017, I felt it was important to revisit this leadership tribute and add a few more thoughts in his honor. Next to the statue of Dr. Pumerantz, across the Esplanade from the Health Sciences Center, is a fountain with the three building blocks of Western University: Humanism, Caring, and Science. I don’t believe that these were mere words for Dr. Pumerantz; these seemed to be a part of his core values. He was a kind, caring man. That was particularly evident than when he was with his wife, Harriet. And that caring was extended to the faculty, staff and students of WesternU. He loved the students. He seemed energized by them. In his last few years as President, he insisted on being on stage for all 5 commencement ceremonies. He did his best to stand and congratulate each new doctor. I cannot imagine the superhuman effort that entailed. Having participated in five commencements for the College of Dental Medicine, I can begin to understand his love for the students and his pride in their accomplishments. I have a close friend who served as a consultant when the College of Osteopathic Medicine of the Pacific was being organized. He spoke of Dr. Pumerantz as a shrewd business person, and I don’t believe that this was meant as a negative comment. Indomitability, tenacity, and ambition have also been used to describe him. He has also been referred to as a super salesman. Without that, without the drive that goes along with an unconquerable desire for success, Philip Pumerantz could not have accomplished all that he did. My original tribute, slightly edited, follows. Recently, Dr. Philip Pumerantz, President of Western University of Health Sciences, announced his retirement. Even though I have not had the privilege of working directly with him, my nearly six years of contact with him as an employee have provided some valuable lessons. Dr. Pumerantz founded Western University, starting with the humble beginnings of the College of Osteopathic Medicine of the Pacific in 1977. In the intervening years, the university has grown to include nine colleges of various health science disciplines. These colleges form a well-integrated, innovative university. For example, we have been pioneers in interprofessional education in the health sciences. But each college is also making a name for itself within its own discipline in health education. Our College of Dental Medicine, where I am employed, is a trendsetter in dental education. Our clinic facility includes clinics for dentistry, podiatric medicine, osteopathic medicine (family practice), optometry, and an interdisciplinary diabetes center, along with a full-service pharmacy. Each is manned by students who are guided by capable faculty and staff. All of this is noteworthy enough, but by itself, it would not motivate me to consider a tribute. Rather, it is the man himself, Dr. Pumerantz, who inspired me to write this. I believe that we as leaders can learn much from this great man. Allow me to share what has been most significant to me. Dr. Pumerantz was a man of vision: he was always looking beyond the horizon. He surrounded himself with capable men and women who caught his vision and have helped him to make it a reality. Many of these individuals are innovators in their own right, and have been given the freedom to develop excellence in their own programs. He was appreciative. Each year, on the anniversary of my hire, I received a thank you note. This was a very pleasant surprise at the end of my first year. In conversations with us, he always seemed to find something to thank us for. His attitude helped me to realize that my contributions do not go unnoticed. He created a culture of friendship among all university employees. For lack of a better term, he fostered a “Hilton culture” at WesternU, where nearly everyone is happy to help out. Whether it is the maintenance crew, the mailroom staff, security, doctors, or anyone else: we all greet one another and treat each other well. This culture was well established before I joined the faculty, and that made it easier for me to adjust to academia. Dr. Pumerantz was an example of community involvement and community service. Indeed, this is a key point of our success. We put on health fairs and screenings and serve in many other ways. Applying students must show a track record of service in order to be admitted! Not the least noteworthy here is how we as a university have helped to revitalize downtown Pomona. Because of what Dr. Pumerantz has done in the community, I was once thanked by the Mayor of Pomona for all the good we do for the city. Dr. Pumerantz was approachable. He didn’t stay in his ivory tower. He often stopped us to chat. Many university presidents can’t be bothered with that. He embodied the principle of MBWA: management by walking around. Many of my co-workers have told stories of kind conversations with him. Frequently when I was out walking, I heard him call out “Hello, Professor!” He always had questions about how I was doing, how my family was, how the College was doing – he showed an interest. And I always felt appreciated. At a social event, he stopped me, my wife and my daughter, and praised my efforts in building the university. At that point my daughter wanted to be a veterinarian. When he heard that, he made an effort to track down an administrator who could be a key contact for her. He was unable to locate the individual, but his effort and his concern were very much appreciated. Dr. Pumerantz was known for his hospitality. He hosted various events for faculty and staff during the academic year. During our orientation week, which he calls Welcome Week, he and his wife hosted an ice cream social because they wanted to greet all the incoming students and thank them for coming here. For many years this was held in his back yard, until we became too big. Now it is held on campus. But in spite of poor health, they continued to attend. And following our opening ceremonies at the end of welcome week, he hosted a barbecue luncheon for the new students and their families, along with faculty and staff. Finally, I have never heard Dr. Pumerantz speak publicly without praising his wife, Harriet. She has been his partner and his support, and has shared all of his achievements. He was quick to point out that he would not be where he is without her. If each of us were as quick to praise our spouses, this would be a better world. I suspect that there may be some character flaws lurking beneath the surface. In fact, I suspect Dr. Pumerantz might point that out himself. But I have not worked closely enough with him to observe that. I don’t wish to insinuate anything negative; I just don’t want to claim that he can walk on water. I only know what I have seen; but I have seen enough to make me admire this great man as a leader and as a good person. I have a deep sense of gratitude for the privilege I have had to work with Dr. Philip Pumerantz, and for the example he has provided to us. His legacy is one that will benefit all of us. In the two-and-a-half years that have passed since I wrote this tribute, I still feel that deep gratitude for my connection with Dr. Pumerantz, and for the great privilege to be a small part of the remarkable university that he founded. His passing leaves a hole in the hearts of all who have been a part of WesternU, one which osteopathic medicine cannot heal. May we all do our best to continue the legacy which he has established, and continue taking the university, and our individual colleges, to new heights. I believe that is what Dr. Pumerantz would want. I extend my condolences and deepest sympathies to Harriet and the Pumerantz family, and to all who knew and loved Dr. Pumerantz. Requiescat in pace, Dr. Philip Pumerantz. As I reflect on those who have served as President of the United States in my lifetime, there have been the good, the great, the mediocre, and the others. The perspective of history will sort that out. An unspoken expectation is for each President to lead the nation. While each led in some manner, some exhibited strong leadership skills; others were weaker. 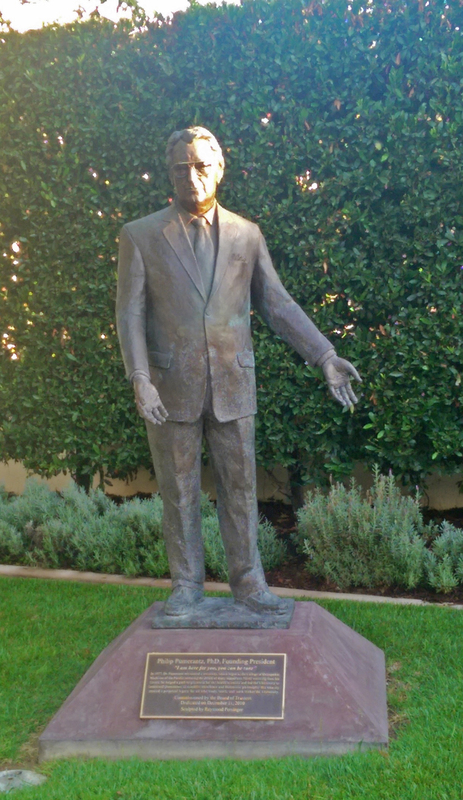 We have had the opportunity to visit the Presidential Libraries of Richard Nixon and Ronald Reagan, and while at each one, my thoughts were drawn to President John F. Kennedy. He did something that none of his successors have done, and honestly may not do again. What did he do? He challenged the people of the U.S. to meet a difficult goal. This challenge unified the nation, and we ultimately succeeded. A good leader gives challenges that help his people grow. There are elements to his challenge that leaders can draw from. Kennedy did his homework. He had some background knowledge. He gave specifics in his challenge. He had an estimate of the costs involved, and was aware of the technology that existed as well as what was needed. Kennedy knew he could not accomplish this on his own. In fact he lacked the skills required to execute the actions he was proposing. He empowered those who had the necessary skills and challenged: “every scientist, every engineer, every serviceman, every technician, contractor, and civil servant” to give “his personal pledge that this nation will move forward, with the full speed of freedom, in the exciting adventure of space.”[ii] He urged Congress to provide them with the resources to do what he asked. He provided a unifying rationale. “Now it is time to take longer strides–time for a great new American enterprise–time for this nation to take a clearly leading role in space achievement, which in many ways may hold the key to our future on earth.”[iii] Remember that this was in response to the Soviet Union developing manned space capabilities, in connection with the Cold War. He created a spirit of competition. And then he said it wasn’t exactly a competition: “This is not merely a race. Space is open to us now; and our eagerness to share its meaning is not governed by the efforts of others.”[v] This served to motivate everyone involved. And all Americans were involved, in one way or another. He asked for a firm commitment. This is absolutely critical in achieving a goal, especially an overwhelming goal like Kennedy’s. “Let it be clear that I am asking the Congress and the country to accept a firm commitment to a new course of action, a course which will last for many years and carry very heavy costs.”[vii] There was absolute transparency in his request, long before we started demanding transparency of our leaders. Finally, he issued a call to action, and a request for all to make the necessary sacrifices to achieve this goal. He knew this was a hard thing to do, and asked us to do it because we do hard things. What was amazing to me as a child now seems somewhat commonplace to most people. There were 135 Space Shuttle missions, and numerous trips to the International Space Station that no longer capture the imagination of the public. But this would not have become so ordinary if President Kennedy had not set his BHAG[x] in motion. A good leader gives challenges that inspire his people to stretch and grow; a great leader gives challenges that unify and motivate. Special thanks to NASA for the images from the gallery at https://images.nasa.gov. [iii] Ibid. Many of the technologies we take for granted were developed for the space program and later found use in civilian life. Examples include personal computers, microwave ovens, freeze-dried ice cream, and even the satellite systems we rely on for weather and for locating ourselves. [vii] Speech before a Joint Session of Congress, op cit. Remember that he proposing an expenditure of $7-9 billion per year on this project, a fittingly astronomical amount for 1961. At Rice, he proposed an expenditure of $.50 per week for every man, woman and child in the U.S. to continue this endeavor. [viii] Speech at Rice University, op cit. [x] Big Hairy Audacious Goal. This idea came from the book, “Built to Last: Successful Habits of Visionary Companies” by James Collins and Jerry Porras. Their acronym refers to a long-term, usually large-scale goal that changes the very nature of an organization. These colleges form a well-integrated, innovative university. We have been a pioneer in interprofessional education in the health sciences. But each college is also making a name for itself within its own discipline in health education. Our College of Dental Medicine, where I am employed, is a trendsetter in dental education. Dr. Pumerantz is a man of vision: he is always looking beyond the horizon. He has surrounded himself with capable men and women who have caught his vision and have helped him to make it a reality. Many of these individuals are innovators in their own right, and have been given the freedom to develop excellence in their own programs. He is appreciative. Each year, on the anniversary of my hire, I receive a thank you note. This was a very pleasant surprise at the end of my first year. In conversations with us, he seems to find something to thank us for. His attitude helps me to realize that my contributions do not go unnoticed. He has created a culture of friendship among all university employees. For lack of a better term, he has fostered a “Hilton culture” at WesternU, where nearly everyone is happy to help out. Whether it is the maintenance crew, the mailroom staff, security, doctors, or anyone else: we all greet one another and treat each other well. This culture was well established before I joined the faculty, and that made it easier for me to adjust to academia. Dr. Pumerantz is an example of community involvement and community service. Indeed, this is a key point of our success. We put on health fairs and screenings and serve in many other ways. Applying students must show a track record of service in order to be admitted! Not the least noteworthy here is how we as a university have helped to revitalize downtown Pomona. Because of what Dr. Pumerantz has done in the community, I was once thanked by the Mayor of Pomona for all the good we do for the city. Dr. Pumerantz is approachable. He doesn’t stay in his ivory tower. He will go out of his way to chat with any of us. Many university presidents can’t be bothered with that. He embodies the principle of MBWA: management by walking around. Many of my co-workers have told stories of kind conversations with him. Frequently when I have been out walking, I have heard him call out “Hello, Professor!” He always had questions about how I was doing, how my family was, how the College was doing – he showed an interest. And I always felt appreciated. Dr. Pumerantz is known for his hospitality. He has hosted various events for faculty and staff during the academic year. During our orientation week, which he calls Welcome Week, he and his wife host an ice cream social because they want to greet all the incoming students and thank them for coming here. For many years this was held in his back yard, until we became too big. Now it is held on campus. But in spite of poor health, they continue to attend. And following our opening ceremonies at the end of welcome week, he hosts a barbeque for the new students and their families, along with faculty and staff. Finally, I have never heard Dr. Pumerantz speak publicly without praising his wife, Harriet. She has been his partner and his support, and has shared all of his achievements. He is quick to point out that he would not be where he is without her. If each of us were as quick to praise our spouses, this would be a better world. I don’t want to claim that he can walk on water: I only know what I have seen; but I have seen enough to make me admire this great man as a leader and as a good person. We tend to become like those whom we admire if we really look at why we admire them. A leader chooses his or her heroes carefully.